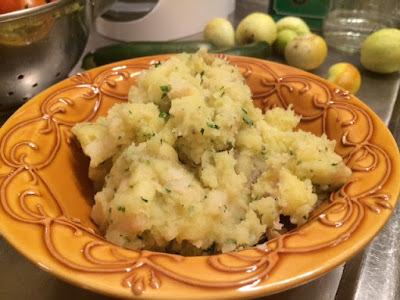 If you like the flavor of celery you have to give this mashed potato and celery root combo a try, it’s a quick and easy side dish that can accompany just about anything you’re cooking. The celery root is often sold under the name celeriac. Wash, peel, and cube twice as much potato than celery root before boiling both in a pot of salted water, the celeriac will need a ten minute head start. When they’re soft enough to pierce with a fork drain thoroughly and return the vegetables to the pot over low heat. Add butter and or olive oil as well a bit of chopped parsley then mash, salt and pepper to taste.